"The secret to becoming a fast, strong, dominant ice hockey player!" As a hockey coach, there's nothing more valuable than time. Between work, family and juggling practice - there's no wonder we have little time to properly plan hockey practice. Hey, having run off-ice training programs for teams at all levels and having coached at the collegiate level, I can relate! Save time! By not having to re-create the wheel each day, it saves me at least 2-3 hours per week. About 6 months ago, I let Mark, a friend of mine who is also a hockey coach, "borrow" my system. And the results were astonishing.. He said I'd be crazy not to offer this to other coaches. In fact, he said I should charge at least $500 for this program (since that is what other "gurus" charge for similar programs - and they are not nearly as complete as mine). So, after some thought, I decided to take a leap and humbly offer my system for sale to you, my fellow coach. I took some time to add in the most up-to-date information and make it a complete “how-to” guide. Rather than going on and on about how great my system is (and how much your athletes will benefit), here's a simple breakdown and summary of each "blueprint". Should you or should you not test? The answer might surprise you. A slow jog around the rink and 10 minutes of stretching simply isn’t an effective warm-up. This blueprint will show you why. A core training program revolving around crunches and leg throw-downs is not only ineffective, it can be downright dangerous. Understanding speed training for hockey has never been so easy. On-ice performance is all about starting, stopping, and changing directions quickly. In this blueprint, you’ll learn how to effectively use agility and quickness training to maximize on-ice carryover. Bottom line, conditioning can make the difference between winning or losing, celebrating a championship or another disappointing season. On the ice, strength isn’t nearly as important as power. What’s the difference? Power is the ability to produce strength rapidly, to be strong fast. In this blueprint, you’ll learn everything you need to know to develop highly effective power training programs to develop quick, explosive athletes. Over 14 jumping exercises and variations complete with descriptions and over 45 pictures. Hockey players need a certain amount of range of motion around specific joints to maximize performance and minimize injury risk. Having said that, flexibility training used the wrong way can significantly increase injury risk. 22 stretches and variations complete with descriptions and over 40 pictures. A ready-to-use testing sheet that you can print out and use with your athletes. It’s all there! I’ve left nothing out. You might be skeptical and that’s okay. "The HTU Off-Ice Performance Training Course effectively covers all areas of off-ice team training. Kevin has done an excellent job of condensing a lot of information into a product that is easy to understand and implement. I have used many of the presented warm-up exercises with my athletes with success for years and added some of the novel exercises to my current programs. This course will be an excellent resource for hockey coaches of all levels that are looking to improve the quality and effectiveness of their off-ice program." "Kevin Neeld has pulled together a fantastic resource that provides excellent, up-to-date information in an understandable format. This would be a great investment for any hockey coach; I can't say enough great things about it." "Whether you are a hockey coach at the youth, junior, or collegiate level, you owe it to yourself to pick up a copy of Hockey Training U’s “Off-Ice Performance Training Course”. Kevin has put together a resource that can teach a coach with NO training experience how to put together off-ice training programs for their athletes. With everything from training progressions to nutritional discussions, it is truly a comprehensive one stop shop, with every thing you need to know to prepare your players to perform at their best. The best part about this manual, is that Kevin speaks on a level that anyone can comprehend. High quality information has never been so easy to implement. Okay Kevin, I’m In. How much? In an ideal world, every team would have a well-qualified athletic development coach working with them. Except for the top-tier junior, collegiate, and professional organizations, this is just not financially possible. I’ve charged over $2,000 for one week of off-ice training in certain circumstances. Even at $50/hour (as cheap as GOOD trainers come), an organization is likely to pay over $2,000 EVERY season! To acquire this knowledge on your own, it’d cost you hundreds of thousands of dollars in college courses, and countless hours of your time. This entire course is only $197 $97 $47! Even at $197 it’d be a steal. I was originally willing to give it to you for half-price because I believe so strongly in the quality of this information and the ease of its application that I don’t want price to be a barrier for any coach. Not only will you save yourself thousands of dollars this season, but you will save yourself thousands EVERY season by continuing to apply the strategies you learn from this course. So why the extra $50 off? I recently received an email from a 12-year old hockey player in upstate New York. In the interest of anonymity, we’ll call him “Future Crosby”. Future Crosby told me he’d been reading my website and really liked the information. He asked if I had any recommendations for him regarding hockey training programs to help him become stronger and faster. Of course I do! That’s my specialty. When I asked if Future Crosby had read my Off-Ice Performance Training Course, he said no, but he’d love to check it out. A couple days later he sent me another message and said he was going to start saving up his own money now so that he could buy it. I have to tell you, I was EXTREMELY impressed with his attitude. Having paid for almost all of my equipment my whole life, I can relate to having to save money for a long period of time to get something you really want. It really got me thinking. It never occurred to me that there would be young players saving up their allowance and yardwork money to invest in their own development! So for Future Crosby, and all the other truly dedicated hockey players and coaches out there, I'm offering my Off-Ice Performance Training Course for only $47! Reach thousand of coaches instead of doing one-on-one consultations, which saves ME time and money. Save me a ton of time and money in production and shipping costs. Lastly, I promised myself that if I was going to sell something, I wanted to offer a lot of value. In fact, I want my products to provide at least 10 times more value than the cost. So if my product costs $97, I want the value to exceed $1,000. If you don’t feel the product reaches this value, let me know and I’ll give you a full refund. Over $250 in FREE Bonuses! In all my years around hockey, there is one thing that not enough teams do that ALWAYS improves team performance. Learn one simple, effective strategy to guarantee your athletes perform at their best, year-round. Hockey teams at all age-groups are beginning their season with a pre-season camp. The off-ice training used at these camps typically results in DECREASED athletic performance, and frequently leads to injury. I recently developed and ran a 1-week off-ice training program for an entire youth organization, from squirts through midgets (8-18 year olds). At the end of the week, all the athletes felt great, moved better, and performed at a high level on the ice. In fact, the midgets won a tournament championship the weekend immediately following the camp. That certainly beats limping around for a week! This training guide is the exact program I used for this organization. I almost NEVER give away my programs. With something for athletes of all ages, you won’t want to miss this! 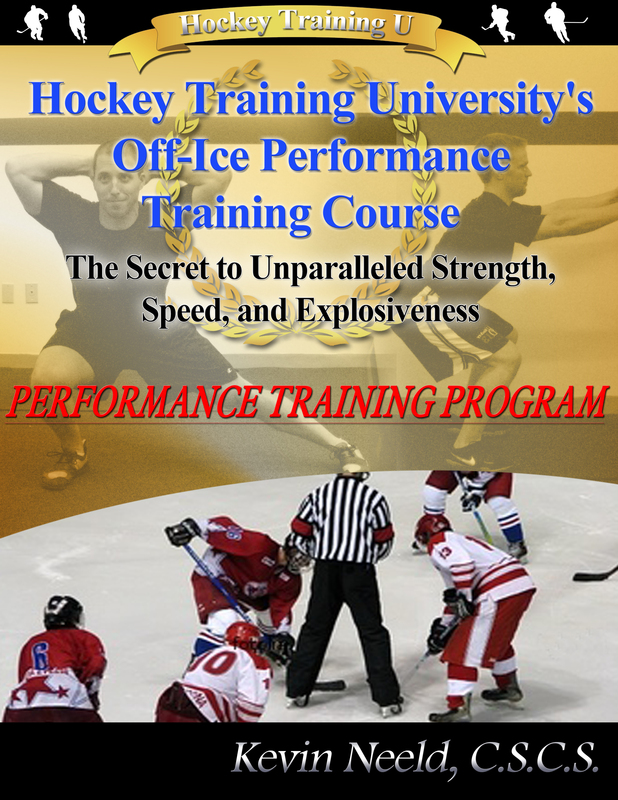 Click here to download Hockey Training University’s Off-Ice Performance Training Course NOW! Try Hockey Training University’s Off-Ice Performance Training Course For 60 Full Days With A No-Risk, 100% Money Back Guarantee! 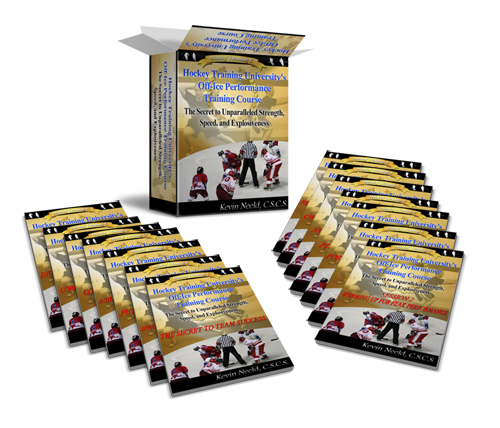 "Test drive" the Hockey Training U System for the next 60 days with absolutely no risk. 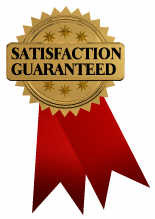 You are completely protected by our 100% money back guarantee. In fact, if you're not completely happy for any reason at all, then I insist that you ask for a refund. However, after seeing so many hockey players take their game to the next level utilizing the concepts in this course, I'm totally confident that your players will achieve a whole new level of athletic excellence. P.S. Don’t wait another second. Learn the secrets to powerful off-ice training before your competitors do!